Meador shows how to build a portable forge out of angle iron. By using new parts, the firepot can be built for little more than the shipping cost of a small store-bought firepot, and for a few dollars more, a rock solid stand can be built to hold it. 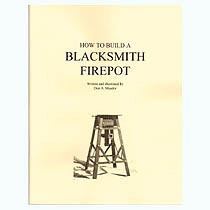 There are a few pages, devoted to blacksmith beginners, that describe how to select a fuel, how to control a fire, how to read the color of the burning coals, how to calculate the cost of a bucket of coal knowing the cost of a ton of coal, and how to make a simple coal rake.